Pictured are the Sanderson family, Siobhan, Heath, Sam and Grace at McDonalds on the Cork Road in support of this years Easter Bunny Fun Run. McDonalds have kindly come on board to sponsor a Happy meal Voucher for every child who crosses the finish line of the 5K walk or 5mile run as part of their goody bag. Also included are organisers of the Bunny Run. It’s hard to believe but Sunday next, April 21, will see the seventh annual Easter Bunny Run take place at the Waterford RSC. 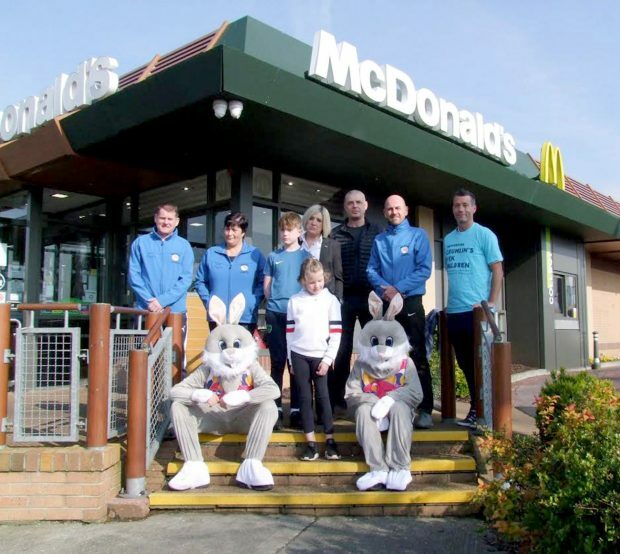 This week the Sanderson family, Siobhan, Heath, Sam and Grace visited McDonalds on the Cork Road in support of this year’s Easter Bunny Fun Run. Grace and her family are showing support for the Children’s Medical Research Foundation (CMRF). McDonalds have kindly come on board to sponsor a Happy meal Voucher for every child who crosses the finish line of the 5K walk or 5mile run as part of their goody bag. This is very much a family event and we welcome everyone along. In addition, to the 5k walk there will be a very competitive five mile road race and Memorial Cup in memory of Christopher Long, so there is something for everybody. We encourage fancy dress for which will have a brilliant prize, among lots of other prizes, second, third places, over 40s, Juvenile with bouncy castles, music, face painting and more. Oh yeah, a free barbeque and chocolate too!! The course is chip timed and officially measured is €15 entry for runners and Walkers are €10. Children are free but must be accompanied by an adult and only two children per adult is permitted on the course for health and safety reasons. You can preregister online at www.bunny-fun-run.com or register on Easter Saturday at the Waterford Regional Sports Centre from 1-4pm or on the morning of the event up to 30mins before the start. Race commences at 11am sharp. Sponsorship cards are still available for anyone who wants one posted out. Drop us an email on the website. Grace, who herself has received fantastic care from Crumlin Hospital will be cutting the ribbon on this year’s event, and hopes you can all make it along and help raise much needed funds for CMRF. Thank you Waterford for your continued support and we look forward to seeing you all on Sunday next.